Producers and their teams lie at the heart of any VFX project - masters of efficiency, they keep the project on-time and in budget. We’ve packed the essentials of production into this new course, for 6 weeks of intensive hands-on training in our studios. We’ll take you on the journey from concept to delivery, to experience each stage of the production pipeline and see how they interlink. We’ll teach you about the industry - scrutinising different VFX pipelines and getting to grips with the roles, lingo and software used. You’ll learn through workshops, practical software sessions and online tutorials, and you'll also complete a final project to demonstrate your ability to manage a VFX project. We’ve created this course in response to industry demand for trained production staff. We’ve developed this course with successful producers and industry professionals (from the likes of The Mill, Double Negative and Jellyfish Pictures) so it reflects the skills needed in the industry right now. Like all of our daytime courses (full-time), you’ll also have industry experts delivering guest lectures to really bring the content to life. For our July 2018 intake, Adam McInnes, freelance VFX Supervisor known for his work on The Martian, Sheila Wickens, VFX Supervisor at DNEG TV known for her work on Churchill, Emma Larsson, Bidding Producer, and Jacqui Marchant-Adams, VFX Coordinator at Lipsync Post, joined us to share their experience working in the industry. Start your career in production. You’ll experience the different stages of VFX production and complete a practical project, ultimately giving you the skills needed for an entry level role. Learn the essentials of production - including VFX and animation pipelines, production roles, scheduling, bidding, negotiating, previz and managing artists. Intensive training. The course is structured into 6 weeks of intensive study (Mon-Fri, 10am-5pm). We pack a lot into 6 weeks with the aim of getting you ready for entry-level production roles. Theory and practical involving a shoot of a small project. *Students will be expected to shoot a short sequence on location using industry standard crew and equipment. This course is designed to get students their first job in the industry and fast track your career progression. We want to give you the skills and knowledge needed to successfully complete a show on time and in budget. It is a highly practical course which uses the principles of experiential learning to mirror how production professionals work in real studios. This practical experience will give you talking points to stand out in an interview and help you move through the ranks from Runner - Scheduler - Coordinator - Line Producer - Producer - Exec Producer. It’s exciting to see a course like this being made available. The Production department includes some of our most valued and challenging roles and it’s encouraging to see this course being developed & delivered in collaboration with experienced practitioners including several from DNEG across the Film & TV divisions. We’re already looking forward to welcoming two of the very first escapees from this course into the team at DNEG. Martin Gabriel has worked in VFX for over twenty years (since before Space Jam), first as a VFX Coordinator and then as VFX Producer in London, Hollywood and on location abroad. He has experience of the whole process of VFX in film-making from pre-production to post, as well as in Television and Commercials. In addition, he has had a role in creating facility wide information systems to manage the flow of data. Although he has mostly worked on large budget Hollywood projects, these days he is often to be found working on smaller, independent, European films. Find out more about Martin. 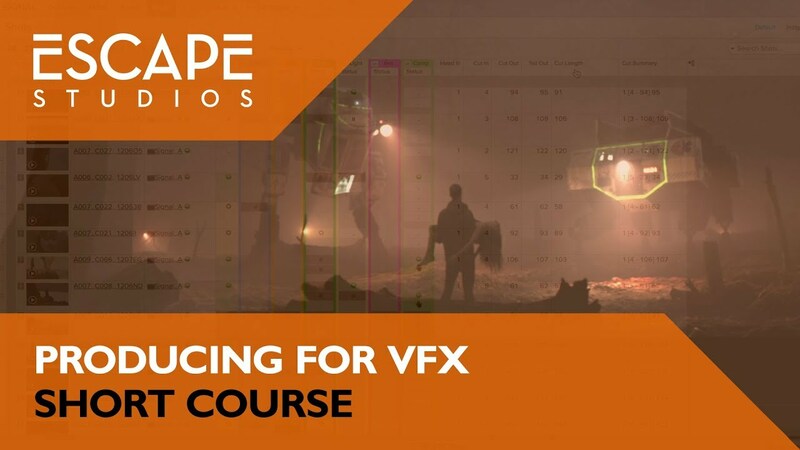 We work alongside an impressive list of VFX studios including The Mill, Jellyfish, Double Negative, Framestore, MPC and many more across all our courses at Escape Studios. I now have a clear map of what happens in VFX and I understand all the opportunities and possibilities within the industry and within the producing path. It is great to understand how everything is linked together." It was really good to be taught by real Producers who are currently working in the industry rather than just teachers. They all knew what they were talking about and gave real life examples. There is so much to learn, the industry, bidding, equipment, software… and there aren’t many other courses like that one. There is an assumption that you need to be a Runner to get into Production but with a course like this, you could get fast-tracked and have an advantage to other Runners. It makes you more employable. Doing the course has helped me to plan how to progress in my career. I now know what I need to do in order to progress faster. I feel more confident going back to work now.